In Plumi all content is moderated before becoming available on the web site. Ordinary users must submit content for publication (as described in the chapter on Publication States) unless they are Managers, Reviewers or Editors themselves. See User Roles and Management for more info on this. The process whereby content is submitted, retracted, published or sent back, is known as the publishing workflow (a Plone term). A Member creates content - it is automatically submitted for publishing when it is saved. The Member could retract the content, choosing to re-edit it and re-submit it for publishing, or choose to make it private (where it is not viewable to anyone else but the owners of that content, or a Manager) or in the public draft state (where it is viewable, but not included in site listings such as Latest Videos or the front page). An Editor could choose to retract (make public draft), re-edit that content, and then re-submit it for publishing. A Reviewer could choose to publish the content, or send it back (making the content a public draft). A Manager could choose to re-edit, publish, send back, make the content private, or even delete it. Once the content is published, any of these options are still available. A Review List is used to list all content that has been added by Members, and then submitted for publication. This makes it easy for Reviewers to see what content needs to be reviewed. All Reviewers are also emailed automatically when new content is submitted for publication. To visit the Review List, you must be logged-in as a Reviewer, and then click the Review List menu tab, or the link in the sidebar. 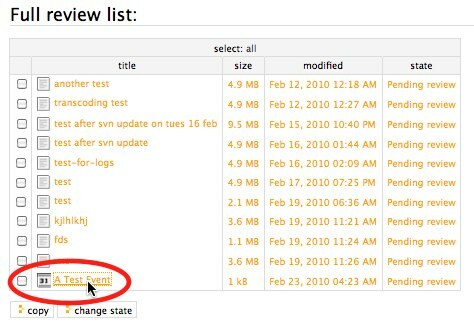 To approve (publish) or disapprove (send back) content click on the content item in the list. Then choose publish or send back from the drop-down state menu. Publishing it will mean the content "goes live" on the website and is included in all listings. Sending it back will mean that the content goes into the public draft state, and an email will be sent to the contributor to notify them it has been sent back. Note: both the publishing workflow, and the text within the email notification can be configured (if you are a developer you can visit the configuration chapter for more info on this).